This vegetarian African stew is full of different textures and flavors that make it hearty and unique. 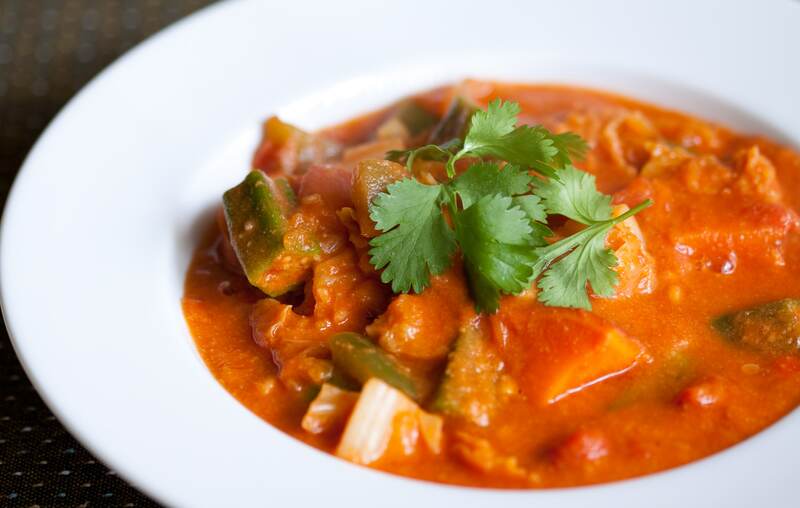 If you’re not familiar with African fare, the seasonings may be reminiscent of a Thai or Indian curry thanks to the peanut butter and coconut milk combination, but the tomatoes, ginger, cinnamon, cumin and sweet potato make this dish its own special cuisine. The slow cooker is really key here, as it helps all the flavors blend together in a rich, velvety finish. It’s a little spicy, so make sure you’ve made plenty of rice to mitigate the heat and add some extra carbs to the dish. In a blender or food processor add garlic cloves, cilantro, ginger, tomatoes, peanut butter, cumin, cinnamon, ground red pepper and curry powder. Blend until everything is nicely pureed. It will look very thick and pasty. In the slow cooker, add the garbanzo beans, chopped onions, red bell peppers, and sweet potatoes. Add the peanut sauce mixture, brown sugar and the coconut milk and gently stir to incorporate all of the ingredients. Turn the slow cooker on low and cook for six to eight hours Serve with rice and top with fresh cilantro and sliced green onions.